Pop Luck Club launches an ad campaign featuring its member families in order to reduce stigma around gay parenting. 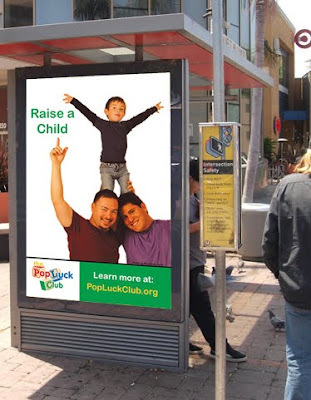 Los Angeles, CA, January 4, 2011 /LGBT News/ The Pop Luck Club, a non-profit organization that supports gay fathers throughout Southern California, announced today the launch of its “Raise a Child” ad campaign that is geared to raise community awareness, support and understanding for gay fathers and their families. The campaign also aims to inspire and aid gay fathers and prospective fathers as they explore the many routes to creating families, including surrogacy, fostering and adoption. The campaign includes radio PSAs and bus shelter ads featuring family portraits of its members. The ads run throughout January across the Los Angeles region, from the San Fernando and San Gabriel Valleys through the West Side, Central and East L.A. to Long Beach and Orange County. Since its founding in 1998, the Pop Luck Club has grown from a handful of fathers to over 500 members. It facilitates monthly “pot luck” play dates, discussions and support groups, online resources and news groups, family events and mentorship programs for prospective fathers.